Federal judge rules Michael Slager’s killing of Walter Scott was second-degree murder. A federal judge ruled today that Michael Slager—the former South Carolina police officer who in May pleaded guilty to using excessive force and violating the civil rights of the late Walter Scott—committed second-degree murder in the fatal shooting of Scott. Federal sentencing guidelines called for 19 to 24 years in prison, and US District Court Judge David Norton’s settled on a 20-year sentence. Slager has 14 days to appeal the sentence. In a sentencing mini-trial that commenced on Monday, federal prosecutors and Slager’s defense attorneys presented evidence to sway Norton’s views about Slager’s culpability on the day he shot and killed 50-year-old Scott during a traffic stop gone bad. Prosecutors had argued that Slager committed second-degree murder, while the defense claimed his offense was, at most, voluntary manslaughter. After the judge ruled that Slager would face a murder penalty, members of Scott’s family addressed the court. According to ABC News 4 reporter Bill Burr, who has been live-tweeting the proceedings, the victim’s mother, Judy Scott, told the court “I forgive Michael Slager.” She then looked directly at him. “I forgive you,” she said. But mainly the family just talked about Walter. 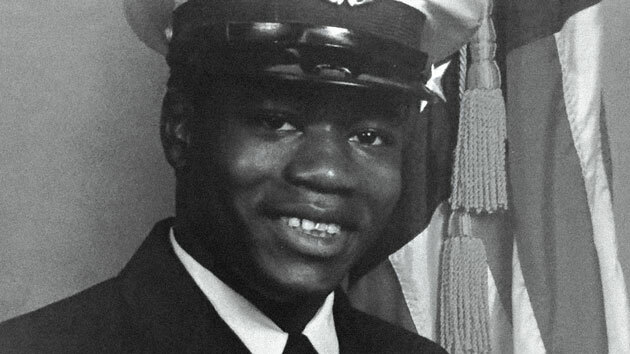 Walter Scott in his Coast Guard days. State prosecutors had tried Slager for murder last fall, but the judge declared a mistrial after a mostly white jury failed to reach a unanimous verdict—either on the charge of murder or a lesser manslaughter charge. Mother Jones covered that trial and the events that led up to it in a feature story that included a visit to the academy where Slager was trained. Scott had fled his vehicle after Slager pulled him over for a broken taillight on the morning of April 4, 2015. There was a tasering and a tussle, and when the unarmed Scott managed to run away, Slager fired eight shots from behind, killing him. A bystander’s cellphone video of the fatal chase went viral, and Slager was charged with murder in a case that became a rallying point for the Black Lives Matter movement. At this week’s hearing, attorneys for Slager and the state called expert witnesses to the stand to bolster rival interpretations of the video and audio, which included some dash-cam footage from Slager’s car. At issue was Slager’s state of mind and the facts of the physical altercation that preceded the shooting—including whether Scott had handled Slager’s Taser and what was said between the men. The defense argued for a lenient sentence, claiming that Scott had resisted and grabbed the Taser and that Slager had feared for his life. (In a presentencing memo, Slager’s lawyers even cited Attorney General Jeff Sessions’ memory lapses while under oath to justify discrepancies in Slager’s accounts.) Prosecutors, meanwhile, argued that Slager’s misleading statements and his choice to shoot a fleeing man in the back showed malicious intent and warranted a punishment of life in prison. Judge Norton, according to Burr, said that no matter what sentence he handed down, the Scott family and Slager family wouldn’t like it. But there were no complaints from the Scotts about the findings from Norton, who also determined that Slager made false and misleading statements. The 2015 killing of Scott kick-started efforts to reform local police practices. In 2016, the city of North Charleston agreed to undergo a voluntary review of its department’s polices and practices by the Department of Justice. But under Sessions, a vocal opponent of police reform, the DOJ has refused to release its resulting report to the public and has ended the police review program altogether. In October, North Charleston’s city council voted to move forward with a less-stringent reform agreement negotiated with the Sessions DOJ. 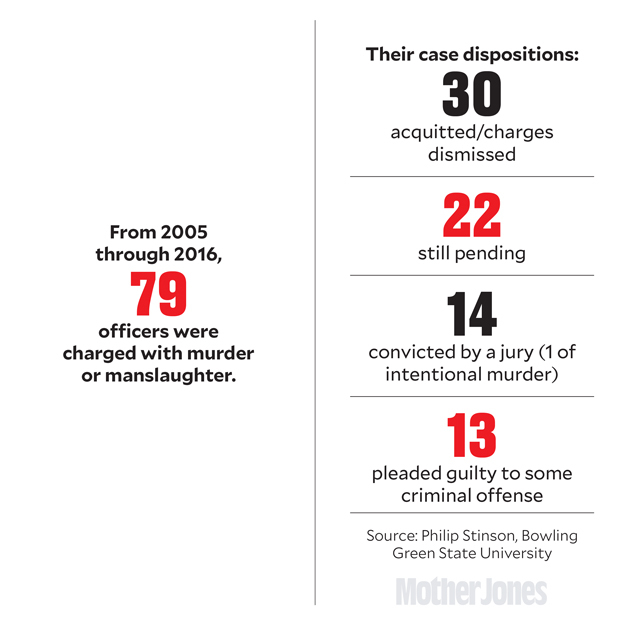 This chart was produced before Michael Slager pleaded guilty to federal charges. This story has been updated to reflect the specific sentence Slager received.